HMF designed a 3-tier mezzanine floor to take advantage of the height of the building. Our customer wanted to use all the available space of the building and our design proved successful in winning the contract. Installation of a 3-tier mezzanine floor structure. Installation of access staircases to each level of mezzanine floor. Installation of a goods lift accessing each level of mezzanine floor. Installation of 2no spiral external staircases at each end of building – This was required to satisfy building regulations in terms of escape distance to fresh air. Each level of the mezzanine had escape access via the new formed openings and fire escape spiral staircases. The Installation of slimline Pallet safety gates at each level of mezzanine for pallet loading ensured safety was maximised. The Installation of hand and knee railing around the open perimeter of mezzanine structure. The Full installation of Racking systems for pallet storage and hand picking. Full Lighting / Emergency Lighting and Fire Alarm System Installation in accordance with Building Regulations. 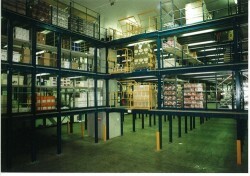 The mezzanine floor was designed for expansion in case our client required more storage capacity. A year after the initial installation HMF were asked to expand the 3 tier mezzanine further and both floors were linked seamlessly creating a chamber with a fully enclosed 3 tier mezzanine floor with great storage capacity and access requirements.